Steve Moore is a farmer in Pennsylvania and the former director of the Center for Sustainable Living of Wilson College, where his work included teaching, research, and management of a large CSA farm. 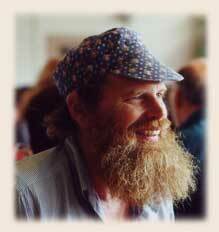 His future work will continue to develop the use of GROW BIOINTENSIVE within a passive solar commercial greenhouse. Moore and his wife Carol have been farming organically for 26 years, using horses for the farm work up until last year. They also had dairy heifers and were raising pigs for market. The farming operation included a greenhouse. 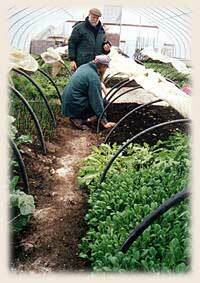 Twelve years ago, needing more income, they were considering expanding the greenhouse. But they started being aware of all the gadgets the greenhouse contained and that it was taking 1,500 gallons of propane every 10 days to heat it. They realized they were missing the mark. They changed their operation and since then have been growing commercially in a passive solar greenhouse, using no fossil fuel at all. Steve Moore teaches John Jeavons about the solar greenhouse's effectiveness. Instead, the greenhouse retains its warmth with double-glazing made of multi-year plastic sheeting. At night, an additional sheet of plastic is currently placed over all the crops to further hold in heat. Initially, the greenhouse was heated by a thermophilic (hot) compost pile, but now a more carbon-efficient mesophilic (warm) pile is used. In addition, the compost pile has seedling flats placed on top of it and serves as a "heating table". At night, this is covered by plastic sheeting as well. The greenhouse has grown lettuce in an average of 5-week cycles (rather than the normal 8-week ones experienced by most people) - except during the three hottest months of the year - with temperatures dipping as low as -17 degrees Fahrenheit in its southern Pennsylvania location. Moore stated that ten years ago they were struggling, and following the current advice to "get big," they rented more ground and bought more horses. Then a neighbor lent Moore a copy of How To Grow More Vegetables. He thought it was good, but totally impractical. However, he attended one of John Jeavons' Three-Day Workshops and has become more and more involved with the method. He has found that the basic precepts of GROW BIOINTENSIVE growing - improved soil structure, raised permanent beds, increased organic matter, close spacing and transplanting - all work well in a passive solar greenhouse. Moore said they are experimenting with nutrition and growing most of their own food. They are focusing on extending the growing season of plants rather than growing out of season. After 4 years of growing GROW BIOINTENSIVEly, the soil in the greenhouse now contains 14% organic matter. And this was soil which was compacted by machinery while the greenhouse was being built. Moore feels that using transplants gives them security, because they know they will have plenty of seedlings at the right time. He mentioned that they use alfalfa in their compost to minimize the nitrate level accumulation that can happen in greenhouse growing. And in the 12 years since they have been using an unheated greenhouse, they have never had a disease problem. During the warmer weather, hot weather crops, such as sorghum, peppers, eggplant and onions, are grown - some of them in troughs hanging from the ceiling of the greenhouse. Peppers have produced 6.0 to 11.1 times the U.S. average, eggplant 5.0 to 6.9 times, onions 2.0 times and bok choi 7.4 times. Moore stated that when he left Wilson College last December, they sold the last of their horses and committed themselves fully to the GROW BIOINTENSIVE method. He looks on this as his version of "downsizing."